I'm happy to be back at the VWBPE conference. Last year, Botgirl Questi and I did a performance piece on virtual identity in front of a few hundred people. Apparently she’s a much better draw. This year it’s just me and I’m here to talk about micro-storytelling. On the surface, micro-storytelling seems like a topic that is only marginally connected to either virtual wolds or best practices in education. But even though "micro" is the antithesis of “Epic!” (the theme of the conference), I think it’s a good match for a number of reasons. First, the micro-storytellers I’m going to discuss in this presentation represent themselves on social networks through avatar identities that were born in Second Life. 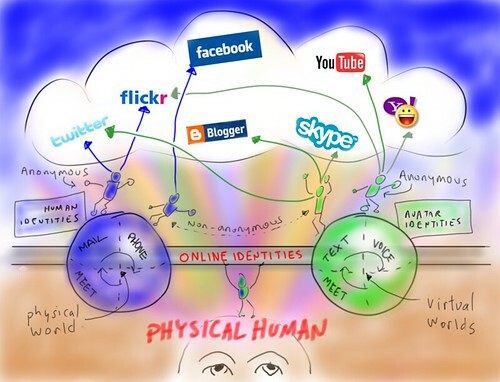 Thousands of avatar-identified people communicate and build community each day on Twitter, Plurk and Facebook. Social networks aren’t just a way we keep in touch with friends made in virtual worlds, they’re also one of the main mediums where we meet and get to know one another. For instance, I met Whiskey Monday on Twitter. She's one of the storytellers I’m going to talk about today. 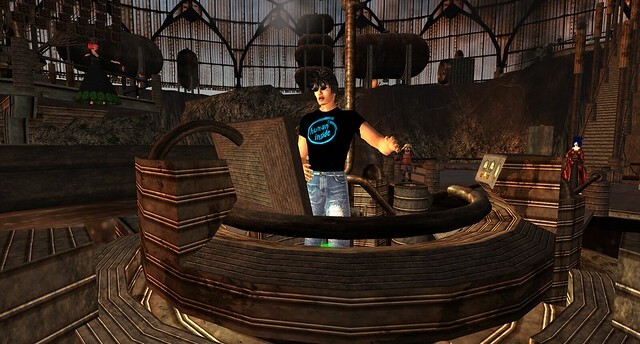 Although our identities were both created in Second Life, we’ve never met avatar-to-avatar in a 3D virtual world. Social networks, media sharing sites and blogs are no longer just a peripheral part of virtual world culture, community and relationships. They have become powerful mediums that both reflect and shape inworld culture. Even if you spend hours a day in a virtual world, you probably interact with only a few dozen people there on a regular basis. Through the use of work computers and net-connected phones which don't have access to Second Life, we’re hanging out in virtual social space 24/7 with thousands of our peers. Another connection between micro-storytelling and virtual worlds is that there is a two-way creative flow between the creative work we produce in virtual worlds and social networks. For instance, visual tweets are one of the emerging forms that are integrating social network posts with virtual world imagery. Although I love these formats both as a creator and a consumer, I think the impact on the creator is the most interesting. I'm speaking about it here because I believe there’s great potential to use these formats in education. My hope is that some of you will be intrigued enough to experiment with it in some of your classes. Although I’m speaking mostly as an amateur enthusiast, this topic also hits home in my professional life. In my day job, I’m one of the principals in a consulting company that does agile software development for large enterprises. My current job title is “Geek Interpreter Guy.” That’s a fun way of saying that I help techies and business people create communication their counterparts can understand. One main challenge is that experts have a hard time seeing the forest for the trees. (I like to joke that it’s because all the trees have been cut down to make the paper used to print fifty page whitepapers and thousand bullet point presentations.) But the real problem is that although specialists know all of the facts in excruciating detail, they often have no clue about how to contextualize the details through a comprehensible story. My loose definition of “story” includes not just the narrative of events, but any communication that delivers meaning. I see the micro-story format as a great reality test for even the most critical communication. The type of fact-filled ignorance that hides in a 10,000 word report or a 50 slide presentation can usually be exposed by challenging ourselves to articulate the main idea in a 140 character tweet.